It was for this altar that Caravaggio painted St. Anne with the Virgin and Child. 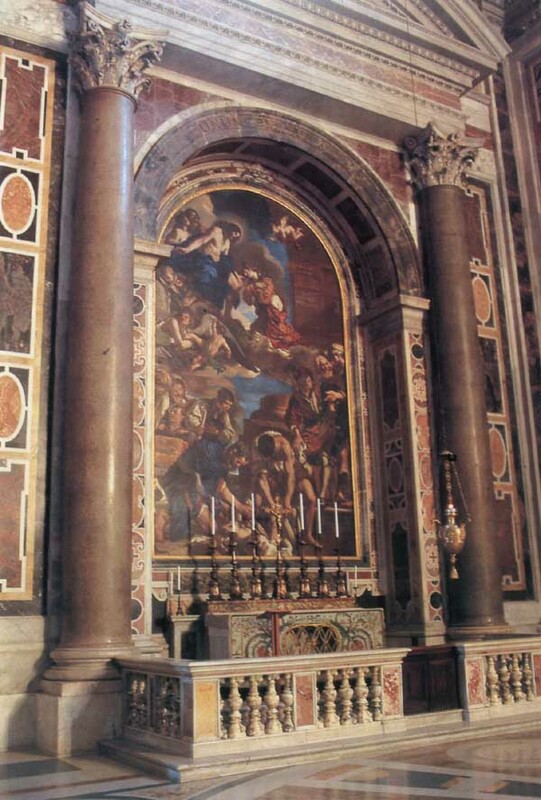 The painting was placed over the altar on April 14, 1606, but was removed two days later. It was for this altar that the first mosaic altarpiece in the new basilica was made, unveiled September 29, 1628, the feast of St. Michael and the anniversary of Urban VIII's papacy. 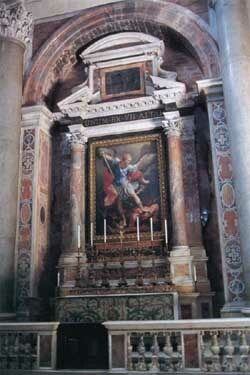 The altarpiece showing St. Michael Archangel, which replaces the previous one by Cavalier d'Arpino, is a mosaic copy dated 1757 of the famous painting by Reni, which hangs in the Church of the Cappuccins. It is a duplicate executed directly from the original, fully conserving that ideal beauty, more graceful than proud, expressed by the artist, so much so that it was said that he had been to heaven to copy it. The main altar in the northwest corner chapel was assigned to the Confraternity of the Palafrenieri in 1605. They planned to dedicate it in honor of their patron saint Anne, and to this end commissioned Caravaggio to paint an altarpiece representing St. Anne with the Virgin and Child. The painting was placed over the altar on April 14, 1606, but was removed two days later, apparently because the Confraternity had meanwhile lost its rights to the altar. Later, a picture by Jacopo Zucchi representing the Ascension provided a temporary altarpiece. Nothing is known of the altar's subsequent history until 1623, when a late-medieval wooden crucifix that had stood over the adjacent altar of St. Petronilla was moved there preparatory to the installation of Guercino's altarpiece. The cardinals of the Congregation ... revived the idea of dedicating the altar in honor of St. Anne. The canons, on the other hand wanted to give the altar the title of St. Petronilla. In the end, the cardinals and canons settled on a different dedication altogether in honor of the archangel Michael. Urban VIII had been crowned on the feast of St. Michael , and was thus especially devoted to the archangel. For this altar, and for no other altar in the basilica, the cardinals commissioned a mosaic altarpiece. The commission was assigned to two different artists. Cavaliere d'Arpino produced the cartoon, and Giovanni Battista Calandra, the leading mosaicist in Rome, translated the Cavaliere's design into the finest glass mosaic. Work began in the summer of 1627, and was completed by the fall of 1628. The mosaic was installed over the altar on September 28, in time to be unveiled the following day, September 29, the feast of St. Michael and the anniversary of the pope. This was the first and for a long time the only mosaic altarpiece in the basilica, and it was universally admired, for its beauty, but even more for its preciousness. 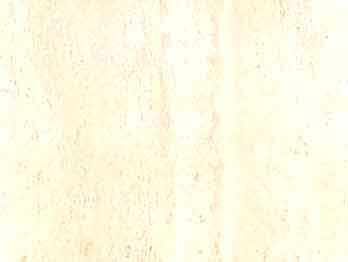 However much it was admired in its own day, Calandra's mosaic did not stand the test of time. As tastes changed, it fell from favor, and in 1756 the Congregation of the Fabbrica decided to remove it from St. Peter's. (By a stroke of poetic justice, it was replaced by a mosaic reproduction of another Barberini-sponsored image of the archangel, Reni's St. Michael in S. Maria della Concezione.) 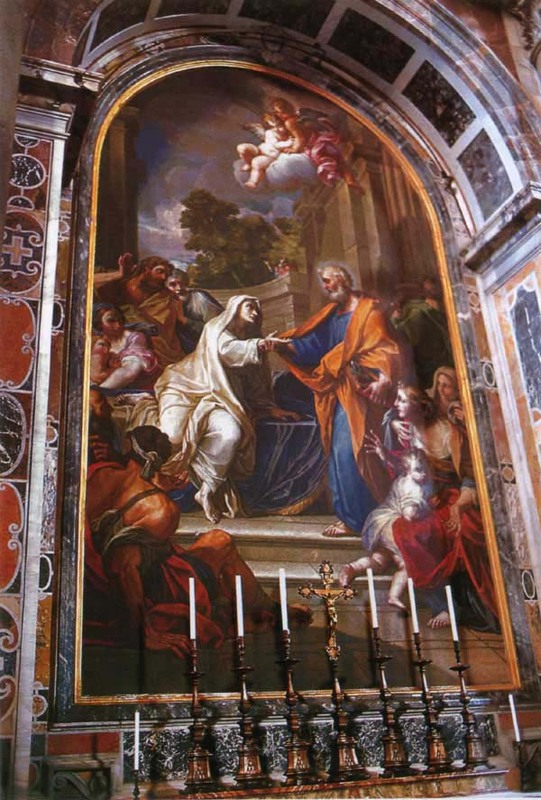 In 1772, Pope Clement XIV presented Calandra's mosaic to the town of Macerata in the Marches; today it hangs over the altar in the right transept of the Duomo. It was for this altar that the first mosaic altarpiece in the new basilica was made. Giovanni Battista Calandra was paid from 31 May 1627 to 18 December 1629 for a mosaic of Saint Michael the Archangel that he executed after a cartoon by Cavaliere d'Arpino, which was painted expressly for the mosaic. In March 1756 the Congregazione della Reverenda Fabbrica judged that since the Calandra mosaic was in bad condition and not worth restoring, it should be replaced by a new mosaic after Guido Reni's Saint Michael in S. Maria della Concezione, Rome. The mosaic was executed by Bernardino Regoli and Giovanni Francesco Fiani, who were paid from April 1757 to April 1758. In 1771 Liborio Fattori, Giovanni Battista Fiani, and Bartolomeo Tomberli restored Calandra's Saint Michael prior to Pope Clement XIV's presenting it to Cardinal Marefoschi, who had it installed in the cathedral of Macerata. The mosaic can still be seen there.